I'm the proud owner of 2 not so new VW Camper Vans. Now what? The Specs: 1978 pop-up, 1972 flat top. Neither of them run. Both have a lot of rust, particularly around the bottom rim..(I don't know car speak.) They've got all their windows, and the interiors don't look too shabby. Anyone ever do any work to a VW? I'm assuming I'll have to replace the metal work, can you buy pre-made bits or do you have to make them yourself... providing you know how to do such a thing. Can it be done with something other than metal? Like fiberglass or carbon fibre? Not that I understand would that would entail. I'm just curious. I'm told the engines on these things sucked and it would probably be smarter to upgrade. Truth? Especially if I tow my boler? [+3] - hingehead - 09/28/2013When I saw the topic my first thought was 'paint flowers on them and travel back to the 60s.' And that's as useful as I get. "Anyone ever do any work to a VW?" you're gonna try and fix them both? And that's as useful as I get. Hoping to. Sell one to pay for the other. Maybe. I dunno. Sometimes I think I've lost my mind. Mine was just a van. I remember thinking it was top heavy, but I tended to like low slung sports cars back then, re driving, say, on twisty canyon roads. Anyway, Ceili, no advice, just interested. Type in repair your vw van on You Tube, there's a good few videos on VW van repair. Not saying they're any good but you might get some ideas from them.. Already did that. It's just I don't understand the lingo, as it were. I'm not really a car cal. We bought them off a friend for real cheap. And now I'm not sure what to do with them. I know what I'd like to happen, but realistically... what have I done. It's all good Osso. I was thinking my kid might show some interest. We'll see. They other one has already laid dibs on borrowing them. I'm just not sure I can get them to go or what it entails, exactly. You're a hippie now .... chill. I know Rockhead would be able to tell you what's needed, what could be done.... but not without eyeballing the vans.. Here's hoping you know somebody local that will give you an honest appraisal of what can and cant be done and what it's going to cost. Do this before you spend a penny on it. I've never owned an own one, driven (and stayed in) a lot of them, though. the 78 is prolly the keeper. pop top and fuel injection. assuming the original running gear is all intact. I'm not sure what you are hoping for as a tow vehicle. you might should go drive one before you decide you want to build one. they are kinda funky to drive and underpowered. all of the body panels are available re-popped. and steel is the only way to approach it seriously. and all of them are rusty. some rust is more devastating than others. Thank-you very much. Yes, I will post pictures once I have them. They're not here yet. The rust is pretty devastating. The lowest bottom panels are rusted out quite severely. I thought maybe I could swap some parts, but they both have the same problems. Double the fun, I suppose. I'm assuming by running gear you mean a running motor et al. I dunno. I'll find out. Slow but steady.... See that is a problem. I love speed. I'm very impatient. I was reading you could exchange motors and put in one with some guts. That could get pricey though. I got them for 250 each. Canadian. And yes, our dollar has started to slide. again. Now? lol... Always been one. Thanks for the advice.. too late. There are a whole bunch around here, I've never had the luxury of being in one. My daughter is all excited at the prospect, although I doubt she'll lift a finger to help in any way. How was yours on the hills? 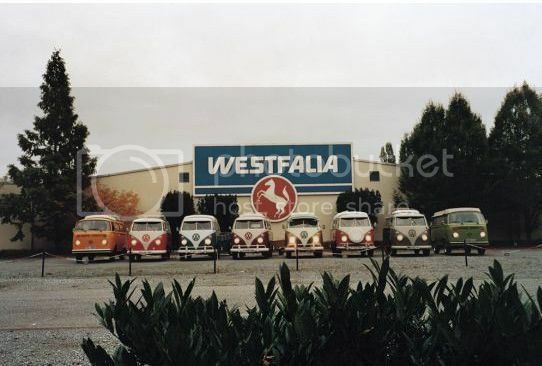 » I'm the proud owner of 2 not so new VW Camper Vans. Now what?